Mix tapes: We all have our favorites. Stick one into a deck, press play, and you’re instantly transported to another time in your life. For Rob Sheffield, that time was one of miraculous love and unbearable grief. A time that spanned seven years, it started when he met the girl of his dreams, and ended when he watched her die in his arms. Rob Sheffield has a gift for writing in a way that helps conjure up your own memories of the music and era he writes about. 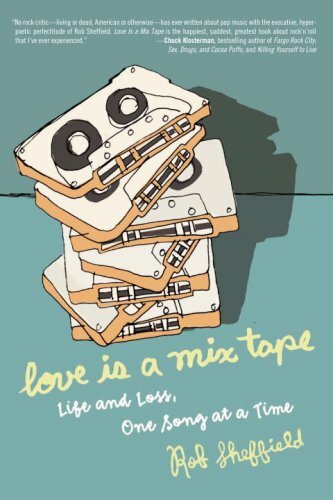 While I was listening to Love is a Mix Tape, I couldn't help but remember so many moments from my own junior high and high school experiences that had been long forgotten. As a whole, I really liked this book. There was one point in the narrative, however, that felt a little disjointed from the rest of the story and that's when he started talking about Jackie...moreRob Sheffield has a gift for writing in a way that helps conjure up your own memories of the music and era he writes about. While I was listening to Love is a Mix Tape, I couldn't help but remember so many moments from my own junior high and high school experiences that had been long forgotten. As a whole, I really liked this book. There was one point in the narrative, however, that felt a little disjointed from the rest of the story and that's when he started talking about Jackie O. When you read this part of the story, you understand the narrative; it's not confusing why he talks about her. It just completely changed the tone and direction of the story and made it feel slightly off-kilter. The rest of the book was thoroughly enjoyable and I love that the rock music of my era is now looked upon as classic rock. There's a point in the story where Sheffiled talks about how he hated Pearl Jam at the time they were making music, but now whenever he hears a Pearl Jam song on the radio, he turns it up and shouts, "YEAH! PEARL JAM!" I feel the exact same way. It's crazy to think now that Pearl Jam is considered CLASSIC rock and that the music of the 90's is looked at collectively as the music of a generation - MY generation. When did that happen?